These are lyrics by The Proclaimers that we think are kind of repetitive. 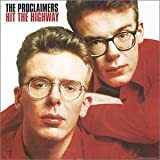 The Proclaimers', "I'm Gonna Be (1,000 Miles)"
1,000 miles to get right at your door. I think we get the idea that the boys in this group would do just about anything to get the girl that they love. There's no need to repeat it 20 times.